Jukka's Pension Ponzi: Rovio IPO valuation is too damn high! 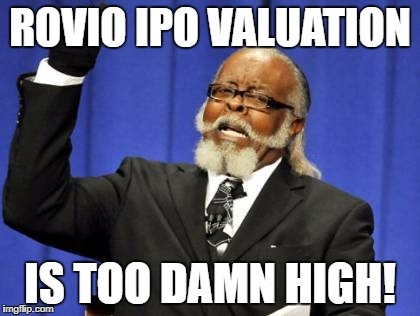 Rovio IPO valuation is too damn high! Rovio is currently IPOing to the Helsinki stock exchange. Taking part in IPOs has been quite lucrative in the near past, so I’m definitely interested! I read Rovio’s IPO prospectus and will publish my notes here. The format ain’t too polished but here goes. Stock sellers get 373 million euro (=exit). Rovio gets 30 million euro only from stock issuance. Future: Mobile gaming estimated to be growing at 14% through 2020. No major operative risks being seen: Second movie is produced by Sony, not Rovio. Number of personnel is reduced to less than half of peak (848 -> 376) (=lean). Operations seem quite professional but still somewhat of a “one hit wonder”. Leadership team (execs and board) all have skin in the game in the company via stocks and/or options. Growth in previous months is very high but the sustainability of such growth seems unlikely. One thing holding me back is my personal disinterest in engaging in Rovio’s games. In the reports one can see that the monthly average revenue per paying user (=MARPPU, one of Rovio’s KPIs) is over 30 euros is stunningly mind-boggling to me! Also, the Angry bird brand seems a bit past is Best before date, but that’s not the worst part. The valuation is too damn high! ..But I may still try and juicy a couple of euros from “greater fools” by partaking in the IPO with a very short term outlook. Another strategy I’m pondering is abstaining for now, checking how the stocks opens in the first minutes of trading and try and do some “play moves” then. The valuation of every listing company is too high currently. It is a bit concerning by itself. Nevertheless, I see a future for Rovio. They are starting to figure out how to make profits without angrybirds even if it still is a big part of their income. Jukka Ponzi is a 30-something guy from Finland who is trying to gather wealth for a pension by means of saving and investing. MIFID2: What the actual f**k?! Detection Technology saa Evliltä ostosuosituksen - Teknologiayhtiöllä on vireillä useita mielenkiintoisia kasvuaihioita.